egtazic acid; a chelator similar in structure and function to EDTA (ethylenediaminetetraacetic acid) but with a higher affinity for calcium than for magnesium. Abbreviation for esophageal gastric tube airway. 1. A natural passage for air to enter and exit the lungs. If a patient has a mechanism of injury involving potential trauma to the clavicles or above, the airway should be opened only with the jaw thrust maneuver. A trademark for a dual-lumen airway consisting of a tracheal tube linked to an esophageal tube. 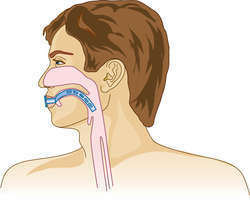 It may be inserted blindly into the oropharynx as an airway control device when an endotracheal tube is not available or when tracheal intubation with direct visualization of the vocal cords is challenging. An airway that is challenging or impossible to intubate. Intubation is increasingly difficult in: older patients, patients with head or neck trauma, obese patients, and patients with craniofacial abnormalities. An airway device (formerly used in EMS systems) consisting of an esophageal tube with a 37-cm long tube attached to a mask. To be effective, the device requires an airtight mask seal on the patient’s face. A balloon at the distal end of the tube is inflated following blind insertion into the esophagus. The device reduces the likelihood of regurgitation and aspiration of stomach contents and indirectly ventilates the lungs. Most emergency service agencies have replaced this device by more-advanced airway devices. An airway that can be blindly inserted into the hypopharynx to use when advanced airway control is needed during procedures that require brief anesthesia. It consists of an airway tube with a proximal cuff, which holds the middle of the tube in place at the base of the tongue, and a distal cuff to fix the end of the tube in the trachea. It should not be used in patients at high risk of aspiration. Bleeding from the nasopharynx may occur during emergency placement of this airway. The head of an unconscious patient should be stabilized before the airway is inserted to reduce the likelihood of cervical spinal cord injury and paralysis. A device used as an alternative to tracheal intubation in the ventilation of the critically ill. It contains both an esophageal and a tracheal lumen and may be inserted without visualization of the vocal cords. Experiments using ATR-FTIR were performed to determine if lysozyme was adsorbed onto CFA particle surfaces and whether the adsorption was inhibited by CFA pretreatment with EGTA. Mg-ATPase activity in low-salt buffer containing EGTA ([Ca. Abbreviations: ANP, atrial natriuretic peptide; BFBO, butanol fraction of Berberis orthobotrys; Cyclic GMP cyclic guanosine 3',5'-monophosphate; Cyclic AMP, cyclic adenosine 3',5'-monophosphate; eNOS, endothelial nitric oxide synthase; PDE, phosphodiesterase; oxLDL, oxidized low density lipoprotein; EGTA, ethylene glycolbis(2-aminoethylether)-N,N,N,,N,-tetraacetic acid; SNP, sodium nitroprusside; 1EB10, l-ethyl-2-benzimidazolinone; L-NA, N-co-nitro-L-arginine; EFBO, ethyl acetate fraction of Berberis orthobotrys; ARBO, aqueous residue of Berberis orthobotrys; 1-Kc, intermediate-conductance calcium-activated potassium channels. The addition of calcium ion chelator, EGTA to thawing solution improves fertilizing ability in frozen-thawed boar sperm. After treatment with EGTA to Furo2-loaded K562 cells, [[Ca. 28 mM), EGTA (1 mM), Nifedipine (20 M) and KCl (30 mM, Depolarising concentration). 5 mM EGTA, 10 mM Beta Mercaptoethanol, 1 [micro]g/ml Leupeptin and 1 [micro]g/ml Aprotinin as per the manufacturer's instructions from Promega). 2] (CN activator) or 50 mmol/L EGTA (CN inhibitor). The Ca++ antagonist activity of the test materials were confirmed further and the isolated rabbit jejunum preparations were allowed to be stabilized in normal Tyrode's solution, which was subsequently replaced by Ca++-free Tyrode's solution containing EGTA (0. EGTA induces the synthesis in escherichia coli of three proteins that cross-react with calmodulin antibodies. EGTA (2008a), "Background--Special advertising formats". Prior to fixation, some oocyte envelopes were isolated by a 15-30 min treatment with calcium-free artificial seawater containing EGTA (ASW Ca-free: NaCl 0.